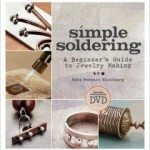 If you’re interested in making jewelry or taking your jewelry skills to the next level, Kate Richbourg’s Simple Soldering is a good place to start. She assumes her readers are starting without any background in metal work, so the first four chapters provide a soldering overview, a guide to setting up a work space, vital safety considerations (after all, a torch flame and red-hot metal are nothing to be careless with! ), and an introduction to tools and materials necessary to the craft. The impatient (i.e., me) may be tempted to skip these chapters, but don’t. Richbourg provides lots of good information that will make your progress much smoother and your learning much more successful. The first chapter where you get your hands dirty (literally: copper can be dirty to work with) is filled with 16 small projects that teach you all the skills you need to use in the remaining projects. Richbourg designs these projects as a sampler, reminiscent of the needlework samplers of earlier days when needlework was an invaluable and highly valued skill. Completing this sampler, too, will give you invaluable skills. 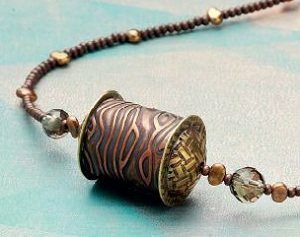 So despite the fact that you will not have a finished piece of jewelry when you have completed these projects, they are vital. Richbourg wants you to be able to work without regard to the finished piece, instead focusing all your attention on learning about the materials, how to handle the tools, getting familiar with the process, and–very important–how to fix an oops when you have one (and you will). 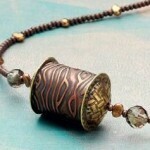 The following 20 projects are organized so that you use increasingly more challenging techniques and combinations of techniques–and of course, each results in a much more satisfying piece of jewelry. On the DVD, Richbourg has a very clear and pleasant presentation style. The visuals are excellent. However, though there is a presentation of the tools you’ll need, and sections on some of the more complex techniques, there is no demonstration of basic things, such as sawing and filing. 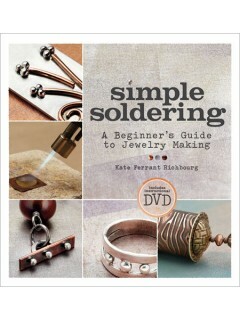 True, this is a book/DVD about soldering, not metal working in general. But because the book is designed for complete beginners, the DVD would have been a great place to walk users through each piece of the sampler so there would be a visual guide to each technique. I also wish that Interweave had used a binding type that would lie flat or, even better, fold back on itself (such as a spiral binding) so that a reader would not have to weight the book open on the bench. That said, though, I think anyone wanting to learn soldering on their own, would be very pleased with what they can learn in this book. You can try this at home!